Boss Jimmy Floyd Hasselbaink says the Cobblers are ‘relishing’ the test of taking on an in-form Portsmouth in the Checkatrade Trophy second round at Fratton Park on Saturday. Town travel to the south coast in the middle of a disappointing run of form. 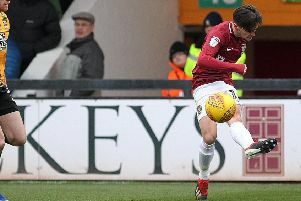 They are without a win in four games, and haven’t scored a goal since Chris Long’s strike in the first half of the 2-1 win at Oxford United on November 11. Last Saturday’s 0-0 draw with bottom-of-the-table Bury did halt a run of three straight defeats, but it was a far from convincing performance, with the players leaving the pitch to boos from frustrated sections of the home support. But Hasselbaink was pleased with his team’s showing against the Shakers, and expects the team to travel to take on an in-form Pompey in confident mood. Kenny Jackett’s team have bounced back from a difficult spell of their own - losing four matches in a row in October - to piece together a five-match unbeaten run that has seen them rise to eighth in the league one table, and to the fringes of the play-off race. “They are doing well, and are a set team,” said Hasselbaink. “They kept the majority of the squad from last season (that won the league two title), and have made some additions. “They have found a way of playing, and obviously their home is a fortress because they play in front of 17,000 or 18,000 people every week, who are their 12th man so it is not easy going there. Town are set to field their strongest team for the knockout clash, that kicks off at 12.30pm and is being shown live on the club’s iFollow streaming service. Sam Hoskins is set to feature after recovering from the hamstring strain he suffered in the 0-0 FA Cup draw with Scunthorpe United on November 4, while John-Joe O’Toole could also be involved. The midfielder is expected to return to full training this week after injuring his ankle 12 days ago, but it could be he is held back until next weekend’s league one trip to Oldham Athletic. Daniel Powell and Aaron Pierre are also back in training and could be involved against Pompey, but Aaron Phillips (thigh) is still out, as is Alex Revell who is recuperating after undergoing an operation on his injured groin two weeks ago.